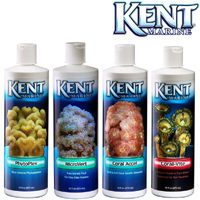 Kent Marine Products has been in the Aquarium Industry for few decades, with many unique & often affordable aquatic treatments and water conditioners. Kent Marine was established by aquarium keeping hobbyists who saw a need for products that aid the user in creating the most natural enclosed marine and freshwater environment possible. We at American Aquarium only sell a few select products from Kent Marine based on our aquarium maintenance experience and client feedback. •	Kent Marine Coral Accel provides complex proteins and amino acids necessary to spur coral tissue growth. •	DIRECTIONS: Shake well before using. Add 5 to 10 ml (1 to 2 tsp) per 50 gallons of aquarium capacity in an area of high water flow. During periods of coral propagation, Kent Marine Coral Accel should be used daily. Depending upon the animal load and coral nutrient demand, it is possible to over feed. •	Does not require refrigeration or freezing after opening, however refrigerating will prolong useful life. •	Kent Marine PhytoPlex provides whole, unicellular phytoplankton for a broad range of filter-feeding invertebrates. Ideal for feeding SPS corals, sponges, clams, scallops, bryozoans, tunicates, sea fans, filter-feeding sea cucumbers, and many annelid worms such as feather dusters and Christmas tree worms. •	DIRECTIONS: Shake well before using! Add 5 to 10 ml (1 to 2 tsp) per 50 gallons aquarium water in an area of high water flow, or by target feeding (recommended). Feed up to 3 times per week depending on animal load. •	Micro Vert is a nutritionally-balanced diet for corals, sponges, anemones, gorgonians, feather dusters and other fine filter feeders. Micro Vert is rich in vitamins and natural minerals from spirulina and kelp. •	For best results, alternate use with Kent Marine PhytoPlex and Marine Coral Accel to provide the nutrient variety readily available in their natural habitat. •	Contains; Deionized water, marine fish meal, hydrolyzed marine protein, shrimp meal, marine lipids, spirulina, kelp, calcium chloride, sorbic acid, sodium benzoate, potassium iodide, calcium iodate, ascorbic acid, thiamine hydrochloride, niacin, pyridoxine hydrochloride, sodium carboate, calcium pantothenate, chlorine chloride, riboflavin, folic acid, cholecalciferol, vitamin A propionate, vitamin A palmitate, sodium EDTA, ferric chloride, natural and artificial colors, menadione sodium bisulfite complex, tocopherol, vitamin B12, biotin. •	DIRECTIONS: Shake well before using. Add 1 to 3 drops per gallon of aquarium water, up to 3 times a week in an area of high water flow. Target feeding individual animals is the most efficient method. In heavily stocked reef aquariums, the dosage may need to be increased. As with any food, over feeding can affect water quality. •	Coral-Vite provides vitamins exotic trace minerals and complex nutrients for health vigor and to stimulate growth in corals anemones gorgonians and desirable marine algae. Phosphate nitrate and gluconate free. •	Contains; calcium chloride, strontium chloride, potassium chloride, manganese EDTA, sodium EDTA, potassium iodide, iron EDTA, boric acid, calcium pantothenate, choline chloride, calcium ascorbate dihydrate, lithium chloride, magnesium chloride, niacin, potassium bromide, cobalt chloride, riboflavin, rubidium chloride, sodium carbonate, sodium molybdate, sodium metavanadate, zinc EDTA, thiamine hydrochloride, pyridoxine hydrochloride, vitamin A palmitate, vitamin B12, biotin, vitamin K, propylene glycol, methyl paraben, propyl paraben. •	DIRECTIONS: Shake well before using. Add 5 to 10 ml (1 to 2 tsp) per 50 gallons each week depending on animal load. Including Metronidazole, Reef Advantage Calcium, Reef Advantage Magnesium, Garlic Guard & more. 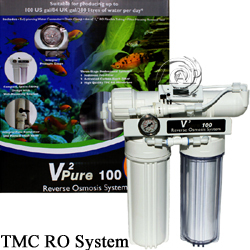 The TMC Premium Fluidized Sand Bed Filter increases Bio Capacity of any Aquarium system, with unsurpassed Nitrifying Bio-Filtration. When used with optional Oolitic sand and NPX Bioplastics, this becomes a MUST Marine Reef Aquarium Filters! !